Monday and Tuesday will see the Sebring short course filled with a large part of the 2019 field testing for the first time this year. 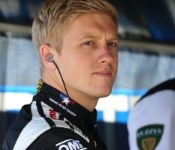 On Monday the Dale Coyne Racing team had the track to itself, and on Tuesday we can expect Andretti Autosport to being 4 cars, Ed Carpenter Racing will bring two cars, Rahal Letterman Lanigan will bring two cars, Schmidt Peterson will bring two and Chip Ganassi will bring at least one car. The teams don’t like to let out their numbers this early, so it’s hard to get much information on who was fastest and who was nowhere. We will get what we can - probably just a few names on top - when we can. Does IndyCar qualify as a sport? Or is it a game? Or does driving around for a while sound more like a hobby? 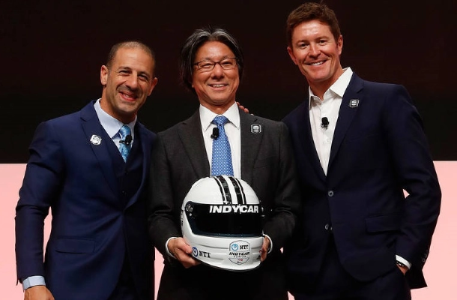 Today at the North American International Auto Show in Detroit IndyCar finally announced that the series’ new title sponsor will be NTT - one of the biggest communications firms in the world - and the series will now be known as the NTT IndyCar Series. 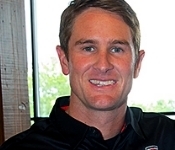 The announcement was a bit of an anti-climax, as for the last few weeks, NBC has broadcast a number of very nice Indy 500 promos during selected football games, and 2018 Champion Scott Dixon, wearing an NTT Data logo, was prominently featured, leading to speculation that NTT, the parent company of NTT Data, was the new series sponsor. NTT Data has been sponsoring Chip Ganassi drivers since 2013, including both Tony Kanaan and Scott Dixon, who were a part of the announcement, today. 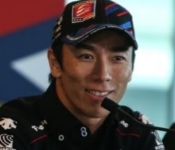 NTT stands for Nippon Telegraph and Telephone and when IndyCar was negotiating the deal they wisely sent Indy 500 WINNER Takuma Sato to Japan to help sell the series. Sato is as big a hero in Japan as one can be - a rock star. 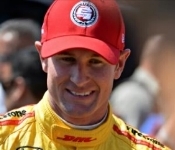 During their tenure as the series sponsor, Verizon developed the very popular Verizon IndyCar app for mobile phones. NTT will do likewise. 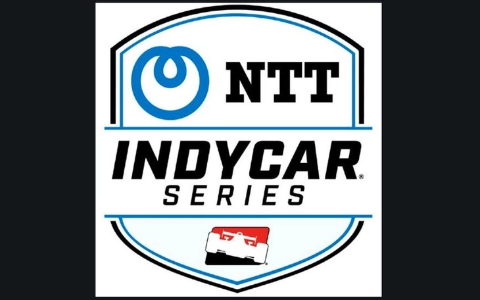 In addition, NTT would like to see IndyCar develop a possible race in Japan on the schedule - one likely to happen near the same time as the Australian race that is also being kicked around again. Makes a lot of sense! 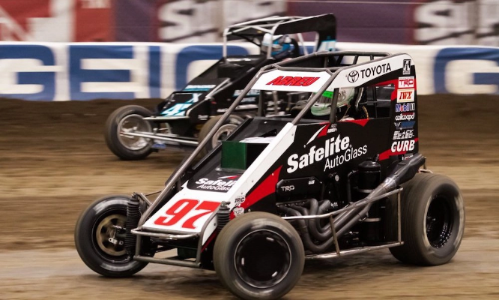 The 33rd annual Chili Bowl - the SuperBowl of Midget racing and one of the biggest events in American open-wheel racing - commenced at the Tulsa Expo Center in Tulsa, Oklahoma, with a great performance by 2018 USAC Midget champion Logan Seavey, who won his heat, his qualifier and then led from the drop of the green flag to the checkers in the 25-lap A Main to lock himself into one of the top five starting spots in Saturday night’s upcoming main event. 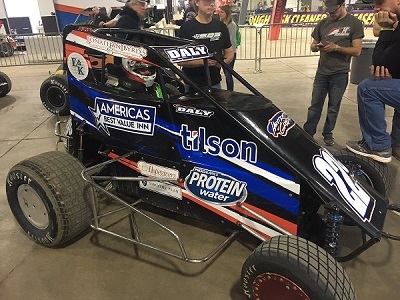 IndyCar driver Conor Daly is among the 350 or so drivers in the Chili Bowl, driving for Jonathan Byrd’s Racing. I’ve tried to watch IndyCar over the years, and I just can’t do it. I’m not a golf person, either. 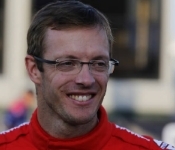 Both Sebastien Bourdais and his Dale Coyne Racing teammate, Santino Ferrucci, tested on Monday and on a different track configuration, so their times cannot be compared to the Tuesday group. There will be no more IndyCar tests in January, so this will have to hold for a while. 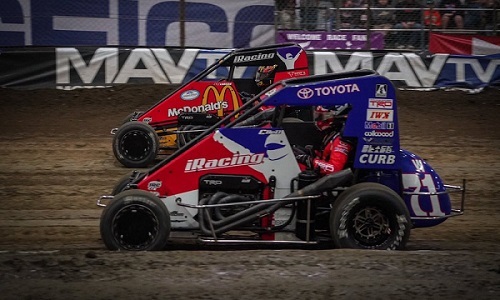 In post # 385 we mentioned that 2018 Midget Champion Logan Seavey was the man of the night at the Chili Bowl on Monday. 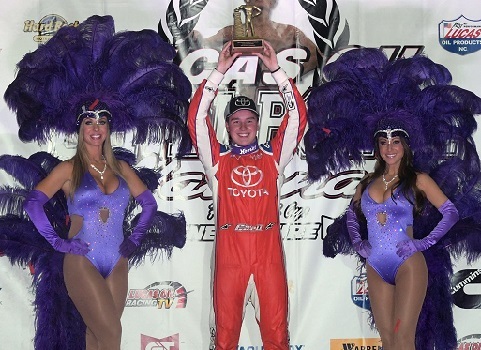 On Tuesday, the WINNER of the A Main was NASCAR’S Kyle Larson - a Chili Bowl regular top performer. 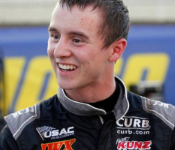 Larson was able to pass and defeat Zach Daum after following him around the dirt track for five laps. This is Larson’s 5th Chili Bowl prelim WIN. Larson had to keep the lead through two caution re-starts. 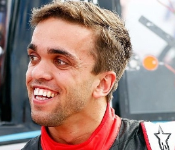 On Wednesday night the WINNER of the A Main was 2015 and 2016 Chili Bowl National Champion Rico Abreu. Starting from P3, Rico took over P2 on lap 3 and then took the lead on lap 7, following a lap 4 caution. Abreu held the lead through 3 cautions. 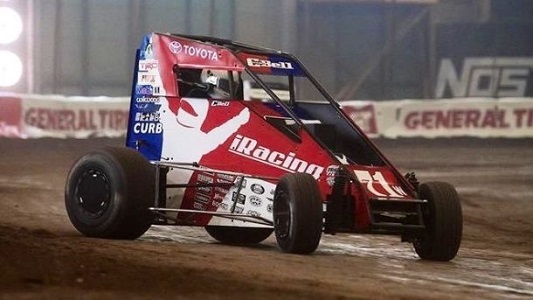 This is Rico’s 4th prelim WIN at the Chili Bowl Nationals. 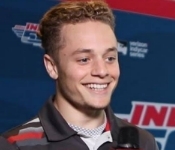 …which recounts his 2018 Indy Lights championship season, race by race, through the highs and the lows. We last checked in at episode # 5 - the two races at Road America - which did not go as well as Patricio hoped and planned. That was post # 379. 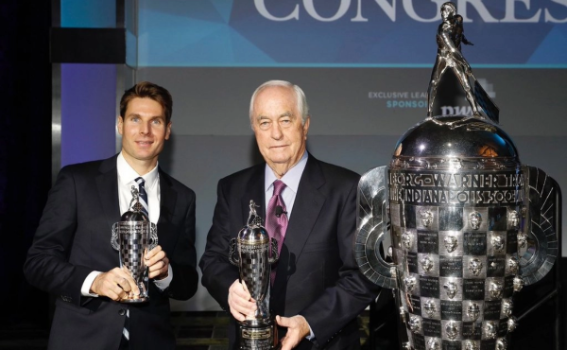 At the Automotive News World Congress at the Marriott Renaissance in Detroit the 2018 Indy 500 WINNER and his boss and team owner were given their “baby Borgs” - the small version of the Borg-Warner Trophy that they get to take home forever, while the big one stays at the Indianapolis Motor Speedway. This was Will Power’s first baby Borg and Roger Penske’s 17th…but who’s counting? 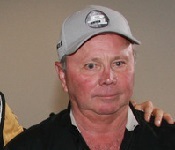 Well, everyone who has been competing against Penske since he got his first baby Borg in 1972, thanks to Mark Donahue…that’s who. The scary thing is that Penske has so much more he wants to do. 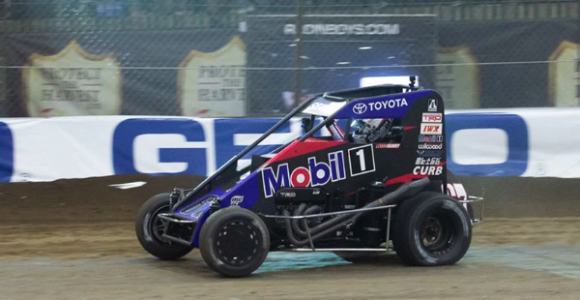 On Thursday night at the Tulsa Expo Center Christopher Bell, the Chili Bowl Champion in both 2017 and 2018, WON the A main to advance to Saturday night’s big 55-lap Main. The 25-lap race was hard to get started and took 4 starts before it got fully underway. Bell, sitting in P3 for three false starts, was moved to P1 when pole-sitter Danny Stratton was penalized for a false start. Bell held the lead on the first complete race lap and kept the spot for the next 24 laps, which included no less that 8 restarts due to incidents and cautions. On a lap 23 restart following a late caution, rival Shane Golobic actually got by Bell for the lead but Bell executed a perfect over-under on the low side of the track and regained the lead before the lap was over. 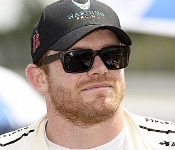 Thursday night was IndyCar driver Conor Daly’s prelim night and unfortunately Conor got a flat tire during his heat race, relegating him to the C Main. In the C Main he went from P8 to P6, but that was not enough to transfer, so his last chance will be on Saturday. 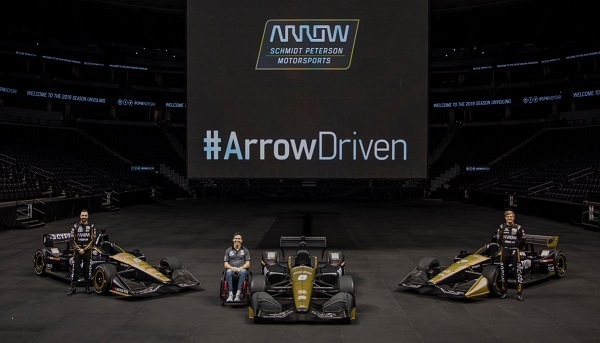 Arrow Electronics started their association with Schmidt Peterson simply as the designers of the special in-car systems that allowed team owner Sam Schmidt, a quadriplegic for the last 19 years, to drive a street car with head movements alone. That eventually evolved into primary sponsorship of team driver James Hinchcliffe’s # 5 Honda for a last several seasons. 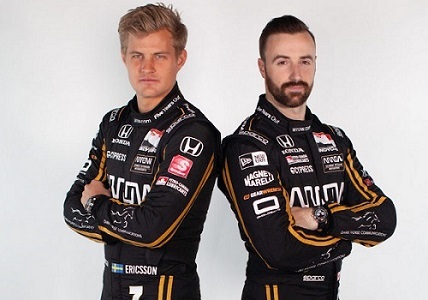 Arrow has now stepped up in a big way to be the title sponsor for the entire team, which will include James’ car and rookie Marcus Ericsson’s # 7 car as well as the # 6 car, waiting for Robert Wickens whenever he is able to again drive it. 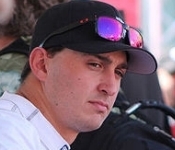 From this point on the team will be known as “Arrow Schmidt Peterson Motorsports” or simply “Arrow SPM”. 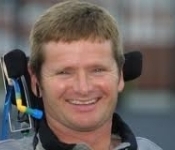 Co-team-owners Sam Schmidt and Ric Peterson figure the huge commitment by Arrow can push the team to a level with rivals Andretti Autosport, Team Penske and Chip Ganassi Racing in the NTT IndyCar series. They are likely right. 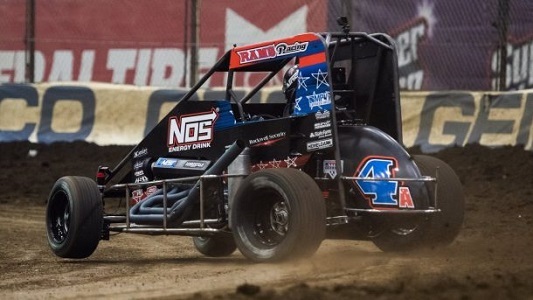 There are a record 355 Midget entrants in this 33rd annual Chili Bowl Nationals and the newly-added Monday night prelims allowed all of them a shot at getting into the Saturday Main, as the top two from each night’s A Main are now locked into Saturday’s 55-lap championship event. On Friday night Justin Grant took the A Main, leading all 25 laps, with P-2 finisher Tanner Thorson being the only driver that could challenge Grant in his dominating performance. Coming in P3 and thus not locked into the Saturday Main was perennial favorite Chad Boat. P4 was was NASCAR’s Ricky Stenhouse Jr.
With 10 drivers locked into the Saturday Main the remaining 14 spots will be awarded with the alphabet of Saturday Mains, starting all the way back with the O Mains and advancing to two B Mains, where the 14 will come from. 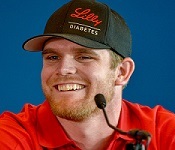 IndyCar driver Conor Daly will start in the K Main-2 feature. If he makes the TOP SIX he advances to the J Mains. If he makes the TOP SIX there he advances to the I Mains…and so on. In theory, he can get to the A Main, but he has a lot of work to do to get there. The 2019 Race of Champion is on!.. The 2019 ROC actually got underway with practices on Friday at the Foro Sol in Mexico City and today the Nation’s Cup is being run all day, with two-driver teams competing for their country against other counties. 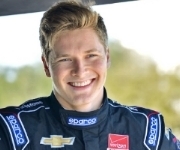 There are four current IndyCar guys in the 2019 ROC - Helio Castroneves, Patricio O’Ward, Ryan Hunter-Reay and Josef Newgarden. 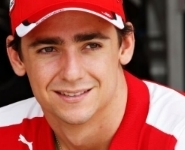 In addition Esteban Gutierrez, who has also driven IndyCars, is in the event. 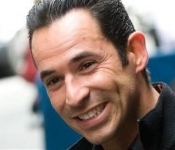 Helio will represent Brazil in the Nation’s Cup with Lucas di Grassi. 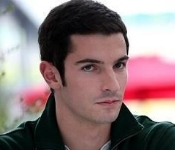 Patricio will represent Mexico with Esteban and Ryan and Josef will be Team USA. 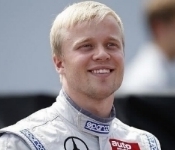 Today at the Foro Sol amphitheater in Mexico City, Team Nordic, comprised of endurance driver Tom Kristensen and World RallyCross Champion Johan Kristoffersson, beat Team Germany, made of Formula 1 driver Sebastien Vettel and Formula 3 European Champion Mick Schumacher, by winning two heats to one. 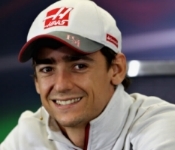 IndyCar drivers did great, as Team Brazil with IndyCar driver Helio Castroneves and Formula E driver Lucas Di Grassi and Team Mexico, with IndyCar drivers Pato O’Ward and Esteban Gutierrez both made it to the Semi-Final, just below the Final, only to lose to Teams Germany and Nordic. Pato was especially impressive, as his Semi-Final was against Johan Kristoffersson and was in the RX Supercar Lite cars - a car Johan drives regularly but Pato has never driven - yet he almost beat Johan. Sunday will be every man for himself as they all go for the Champion of Champions. 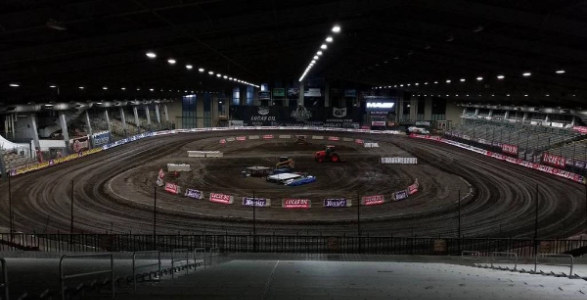 After a full day of whittling the competition down to 24 final drivers, the A Main that was to determine the 2019 Chili Bowl Champion started in the wee hours of Sunday morning. 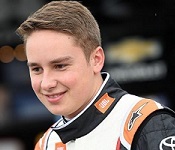 Defending champion Christopher Bell of Norman Oklahoma took the lead of the 55-lap event on lap 54, passing leader Kyle Larson, on the low side, and as the two cars touched, Bell stayed low while Larson drifted up the track, unable to respond. Justin Grant completed the podium in 3rd. The race started with Logan Seavey on the pole, Bell in P2 and Larson in P3. Two cautions voided the starts. 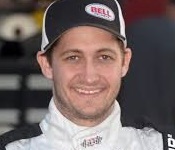 On the 3rd complete start Larson jumped into P2 while Bell fell into P4 behind Justin Grant. For several laps Larson was all over Seavey, trying to take the lead. On lap 20 Bell passed Grant for P3. 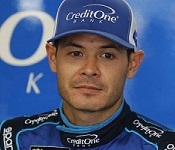 NASCAR driver Larson took the lead of the race on lap 22 while shortly after, on lap 27, Bell passed Seavey to take P2 but a caution saw Seavey reclaim the spot. On lap 33 Bell slid under Seavey to retake P2 but again a caution allowed Seavey back into P2. On lap 34 Bell finally took P2 solidly and went after Larson, with Larson staying on the low side and Bell up high. By lap 48 Larson and Bell were lapping the field. As lap 54 started Larson got Turn 1 wrong and slid up the track just enough to allow Bell in tight pursuit to go under him. The two cars banged wheels as Bell went to P1. Larson tried to get it back going into Turn 3 but harmlessly banged off Bell before clipping the wall after coming off Turn 4, as Christopher crossed the line in P1 for the WIN. That’s it for the SuperBowl of Midget racing for another year. Long live the Chili Bowl! 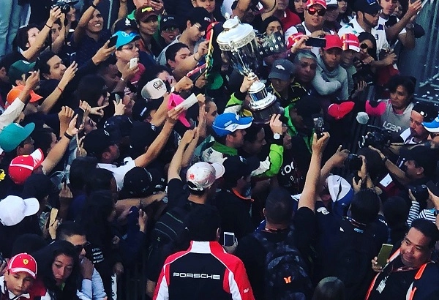 ROC in Mexico - the 2019 Champion of Champions is Benito Guerra!.. 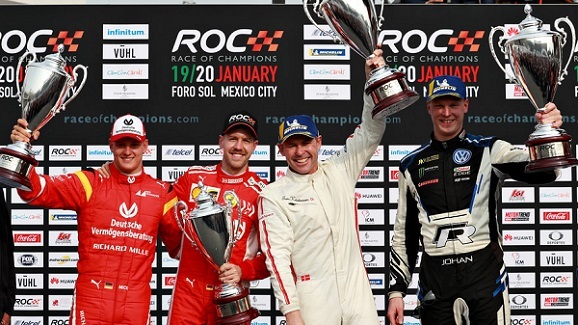 The final for the Champion of Champions on Sunday at the Race of Champions came down to Le Mans WINNER Loic Duval and Mexican Rally Champion Benito Guerra in a best-of-3, after all the other drivers in this first ROC in Mexico had been eliminated. Final Heat 1 was in the RX Supercar Lite and Final Heat 2 was in the Vuhl 05 ROC Edition car and Guerra took both of 'em to take the title for 2019, 2 to 0. Perrenial favorites and former champions Sebastien Vettel and David Coulthard had been eliminated rather early. Yesterday’s Nation’s Cup WINNERS Tom Kristensen and Johan Kristoffersson lost out to Duval and Pato O’Ward in the Quarter Finals. 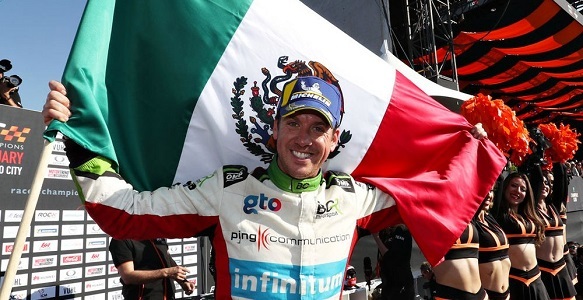 Mexican IndyCar drivers Pato O’Ward and Esteban Gutierrez both made it all the way to the Semi Finals, which further delighted the Mexican crowd, only to lose to Duval and Guerra, respectively. That’s it for another fun Race of Champions! 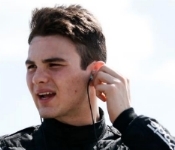 As we reported in post # 381, 2018 Pro Mazda (now “Indy Pro 2000”) Champion Rinus VeeKay is keeping sharp in the off-season by competing in the Asian F3 Winter Series, driving for Dragon Hitech GP. A week ago the talented Nederlander debuted in the 9-race series by taking 2 WINS and a P3 at the Thailand rounds 1, 2 and 3. 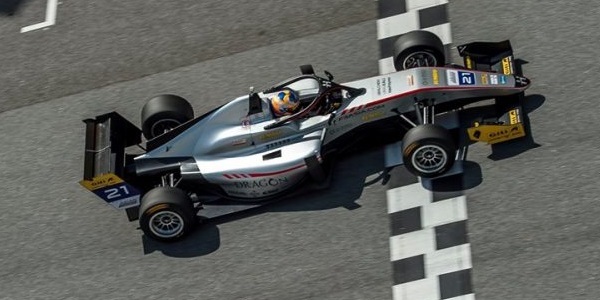 This weekend in Malaysia at Sepang in series rounds 4, 5 and 6, Rinus took 2 more WINS and a P2. Rinus led from pole to checker in both Race 1 and Race 2, beating Ye Yifei for Absolute Racing in both cases. In Race 3 VeeKay again led from pole but his front wing flap broke mid-race and Ye was able to pass him for the WIN. 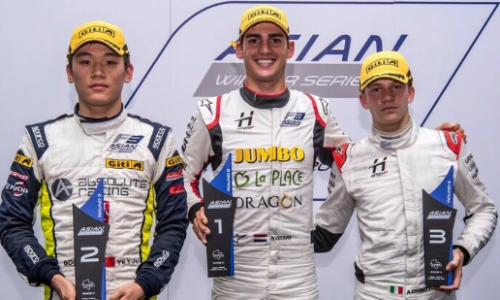 Rinus’ Dragon teammate, Alessandro Ghiretti, was P3 in all 3 races. VeeKay now leads Yifei in the title hunt 133 points to 104, with Ghiretti a distant 3rd with 74 points. The final 3 rounds will be in late February, again at Sepang. 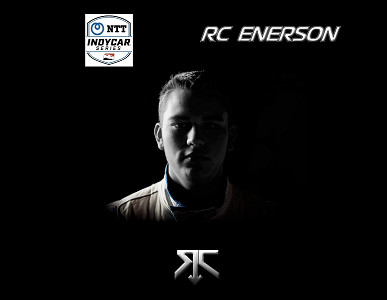 Announced today, one thing we already knew and one thing we suspected was true - both regarding NTT IndyCar Series team Carlin, which was new to the series in 2018, following years of excellence in junior formulas in both the United States and in Europe. 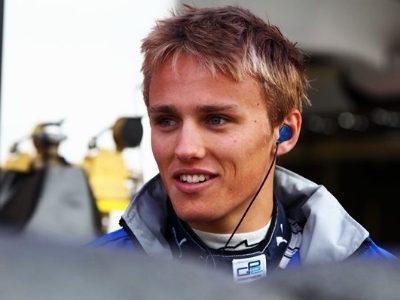 We knew that Carlin’s 2018 driver Max Chilton would be returning to the team to drive the # 59 car for 2019, again with sponsorship from financial services company Gallagher Global. We also knew that veteran Charlie Kimball, Carlin’s other 2018 driver, was going to have less sponsorship from his guys at Novo Nordisk and suspected that might affect his 2019 plans. 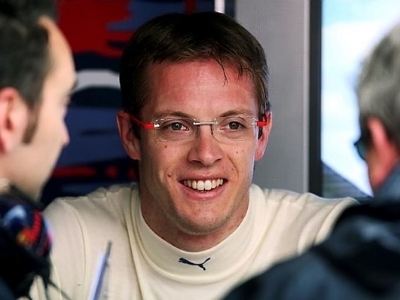 Today, Carlin CONFIRMED Chilton’s return full-time and Kimball’s return on a part-time basis. What Carlin did not confirm was how many and which races Kimball would run in the # 23 car, and if someone else would be in the car for the races he would not run. 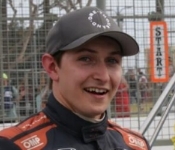 Way back in post # 239 we mentioned that the only other guy to test a car for Carlin in the off-season has been Road to Indy ace driver RC Enerson, who tested at Circuit of the Americas for the team. So, we are STILL waiting to see if Carlin and RC have come to any kind of agreement for 2019, or if the # 23 will sit idle for some races. We can also tell you that RC just started a new website and this is all it has on it, but it’s enough to have us geeking out! C’mon, Carlin. Give us the full story! With this announcement, the only 2018 team that has not given out with any confirmed 2019 plans is Juncos Racing. 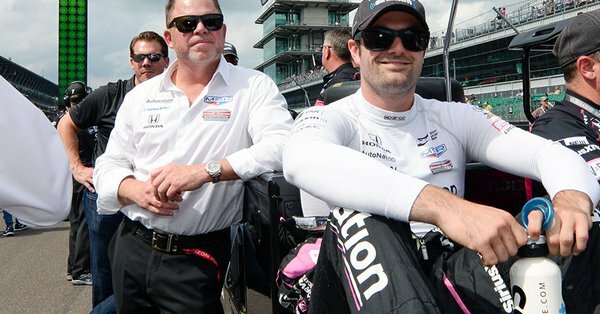 Last year England’s Jack Harvey drove in 6 IndyCar races for Meyer Shank Racing, including the Indy 500. Just announced, the team have committed to doing 10 races this year, including again the Indy 500. 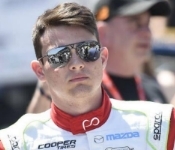 It was an increased commitment by sponsors AutoNation and Sirius XM that will allow the two-time Vice-Champion of Indy Lights to increase his workload. 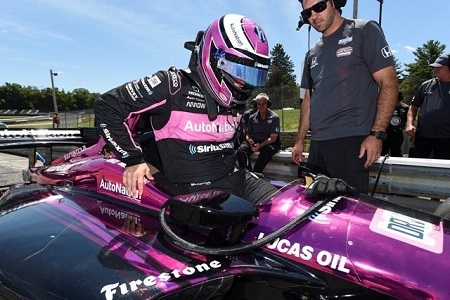 In addition to the Indy 500 Jack will do St. Petersburg, Circuit of The Americas, Barber Motorsports Park, Long Beach, the INDYCAR Grand Prix at Indianapolis Motor Speedway, Road America, Mid-Ohio, Portland and Laguna Seca - all road or street course races. Meyer Shank Racing will once again be technically partnered with fellow Honda team Arrow SPM. In the off-season Jack has been intensely working out and is at least 24 pounds lighter, due to both training and nutrition. His intention is to make a big enough splash in 2019 to get the team a full season budget in 2020. 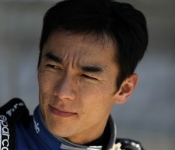 The # 60 Honda will be at Circuit of the Americas for the February IndyCar test, there. IndyCar team owner Ricardo Juncos will also be an IMSA SportsCar team owner in 2019, with a brand new Cadillac DPi-V.R. program in the DPi class of the Weathertech SportsCar Championship series, with the team making its debut this weekend at the Rolex 24 at Daytona. 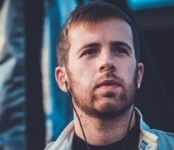 Driving the # 50 Caddy all season will be Pro Mazda alum Will Owen, while added in for Daytona will be 2017 Indy Lights Champion Kyle Kaiser and IndyCar driver Rene Binder, as well as Argentine Agustin Canapino. 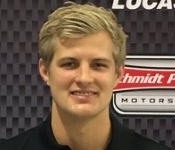 Binder is also scheduled to drive at Sebring, Watkins Glen and Road Atlanta - the other three Michelin Endurance Cup races on the schedule.